To book at University Housing, click here. Please complete your reservation no later than Monday, July 8, 2019. To make a reservation at the Madison Concourse Hotel please call the hotel at (800) 356-8293 or book online here and mention that you are apart of the 36th International Cosmic Ray Conference. All reservations must be made by June 27, 2019 to receive the discounted rate. To make a reservation at the Doubletree Hotel please call (800) 251-5511 and use the code "ICE" or book online here. All reservations must be made by June 24, 2019 to receive the discounted rate. The Doubletree Hotel Madison is in the heart of downtown Madison, Wisconsin, at the eastern edge of the University of Wisconsin campus, nestled between the Lakes Mendota and Monona, within walking distance of the State Capitol, the UW Badgers' Kohl Center, Camp Randall Stadium, and the eclectic State Street shopping and entertainment district. 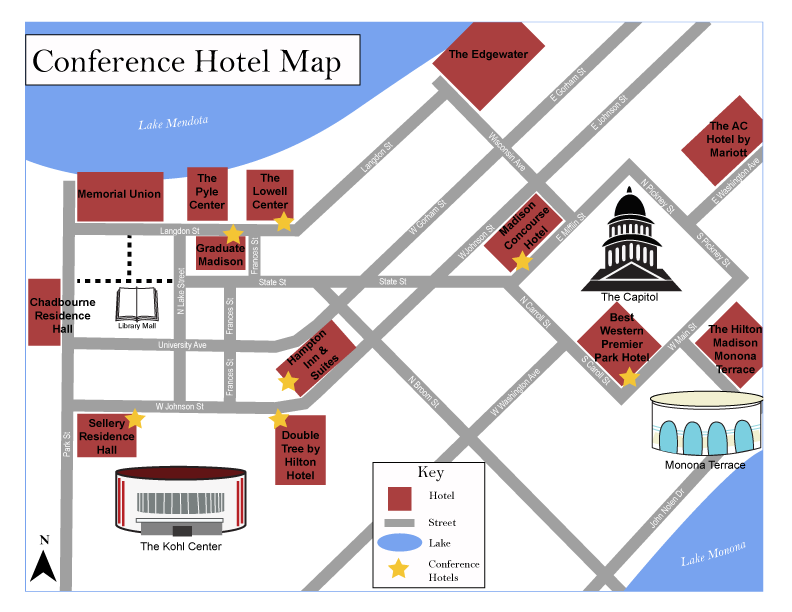 The Doubletree Hotel is about 10 minutes walking distance from conference site. Spacious guest rooms, suites, and executive accommodations boast all the comforts of home and modern amenities such as complimentary wireless high-speed internet access. Enjoy your favorite beverages and casual dining at the Badgerland Bar & Grill, serving breakfast, lunch, and dinner daily. Our hotel guests have full use of a heated indoor pool and whirlpool, outdoor patio, and a fitness room. We also offer complimentary shuttle service to and from the Dane County Regional Airport (15 minutes away), UW Campus, convention center, Alliant Energy Center, and downtown hospitals. Parking is complimentary for on-site hotel guests. ​To make a reservation at The Graduate hotel please call (608) 257-4391 or (800) 589-6285 or book online here. Please let them know you are with the International Cosmic Ray Conference when making your reservation. All reservations must be made by June 19, 2019 to receive the discounted rate. The Graduate Madison is located in the heart of downtown Madison on the University of Wisconsin campus, steps from State Street dining and shopping. As a guest of the Graduate, you are invited to enjoy all of the following services and amenities: Portage Pi, coffee & juice bar with hand pies and healthy eats. Camp Trippalindee, rooftop bar with sweeping views of the Capitol and Lake Mendota, 24 hour fitness center, and complimentary shuttle service. To make a reservation at the Hampton Inn & Suites Madison Downtown please call (608) 255-0360 and mention the 36th International Cosmic Ray Conference or book online here. All reservations must be made by June 23, 2019 to receive the discounted rate. Located in the heart of downtown Madison and adjacent to the University of Wisconsin, the friendly Hampton Inn & Suites Madison/Downtown is within walking distance of shops, galleries, restaurants, and nightspots. Stay here and enjoy easy access to museums, cultural destinations and other Madison, Wisconsin attractions. Stroll around the university's attractive campus, shop, or enjoy lunch downtown, catch a sporting event at the Kohl Center or spend time relaxing on Lake Monona or Lake Mendota. Every inviting guest room and sutie at this hotel in Madison, WI offers beautiful views of downtown Madison. Expect a range of modern amenities including a refrigerator, microwave and a clean and fresh Hampton bed. Watch movies on the 42-inch LCD TV and stay connected at the ergonomic desk with free WiFi. To make a reservation at the Park Hotel please call (800) 279-8811 or (608) 285-8000 or book online and mention you are with the Wisconsin IceCube Particle Astrophysics Center - 36th International Cosmic Ray Conference Block. All reservations must be made by June 23, 2019 to receive the discounted rate. Madison's Capitol Square Hotel - An urban landmark on the Capitol Square in Madison, the hotel is located directly across from the popular seasonal attractions as the Dane County Farmers' Market, Art Fair on the Square and Concerts on the Square. Only blocks from the University of Wisconsin-Madison campus, Frank Lloyd Wright inspired Monona Terrace Convention Center, Overture Center for Performing Arts, and the Kohl Center, the Park Hotel is your best way to experience the heart of Madison. Enjoy an array of modern hotel features while staying in the heart of Madison including complimentary high-speed internet in guestrooms and throughout the hotel, modern fitness room, and indoor swimming pool. Complimentary shuttle service to and from the Dane County Regional Airport and the UW campus add to a relaxing style! Relax and unwind in our well-appointed guestrooms and suites, featuring comfortable furnishings and stylish décor. Enjoy contemporay amenities, including complimentary high-speed internet, 42" flat screen HDTV's, coffee maker, iron, ironing board and hair dryer. Many rooms and suites feature views of the magnificent State Capitol building and Madison's beautiful lakes. To book a room at the Lowell Center, please call (608) 256-2621 or 1 (866) 301-1753 or book online. All reservations must be made by June 27, 2019 in order to receive the discounted rate. Conveniently located near the conference venue, participants staying at the Lowell Center can enjoy close proximity to the Memorial Union (.3 miles/approximately 3 blocks), are within walking distance to a vibrant shopping and entertainment district.